The title for this post says it all! We were thinking of Mario themed Piñatas. Someone had suggested a Boo, and the kids and I thought that a question-mark-box piñata would be cool too. But I’m thinking the simplest idea by far is a Yoshi egg! – Cover a balloon with white two to three sheets of white tissue as your first layer. Soak the first layer in water alone Don’t use paste on this first layer. Misting the paper with water would be a good idea. Add four to six more layers, brushing each with paper mâché paste. I wouldn’t use a flour-based paste for this one as you’ll want something that dries clear. White glue or mod podge works. – Let this dry, then pop and remove the balloon, and carefully slice part of one side off so you can fill it with candy and prizes. We’re going to use chocolate coins, gold star confetti, and whatever other mario themed birthday party favors we can find. Use a few more white strips and your paste to put the side back on. – Cut several large spots out of green tissue paper. Use your paper mache paste to stick them on. – After it’s thoroughly dry, paint the whole thing with mod-podge once more so it’s reinforced. Mod podge dries clear and strong. One word of warning. Chocolate in a piñata during summer only works well inside out of the sun. Just thought you’d like to learn from someone else’s experience. Valid point. Here we’d do it in May (-before- vacation) and it wouldn’t be too hot I’m sure. But bubblegum coins might be a better idea anyway. when you make the pinatas first layer do soak the srips in water first or do you soak the whole thing while its on the ballon??? About how long will it take to dry???? Also, you won’t need to soak the strips. For the first layer, just wet the strips and put them on the balloon. Let it dry a few hours. For the other layers, brush paper mache paste or modgepodge on the strips (a thin coat is perfect) and then make a layer that way. Add another layer or two and you should be good. It should be brittle, hard, and light. If you did all of it with tissue paper without a real paper under layer, it’s going to be softer, which makes it difficult to hang and break, and that’s why my kids just threw stuff at their pinata when we did it. Oh, and if you don’t have 2-3 days to work on this pinata and you need something for a Mario birthday party, here’s an idea: Get two golden-orange, square gift bags. Use them to build a pinata like I did for the fast Spongebob pinata (you can find those instructions here: http://novapages.com/wordpress/ideas/spongebob-birthday-party/ ) — only for a Mario pinata, cut out a big orange question mark and paste it on there. Kinda like these question-box cards: http://novapages.com/wordpress/ideas/mario-birthday-party-2009/ . That’d be cute and VERY fast. Good luck! Also… I thought I’d posted this but apparently not here! The tissue idea, while it was unique, made it harder to hang the pinata, which is why you see it sitting on a stool. I just recommend using thin layers with modpodge so it will be as hard and brittle as possible for this one. I’m having a Mario themed party for my son Ethan tomorrow and the similarities between this post and what we’re planning are spooky! We’re also using question mark boxes for favor boxes and including chocolate coins, then putting the rest of favors in bags in the pinata for each kid. 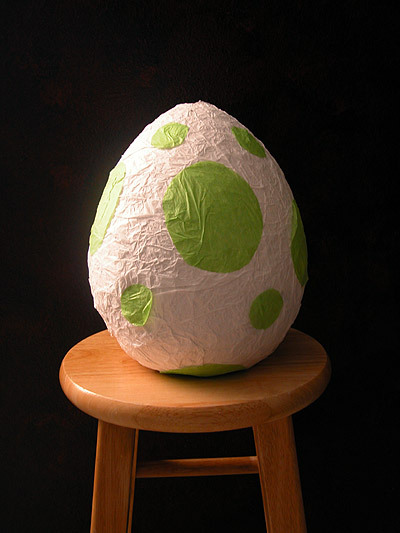 We did our Yoshi egg pinata with newspaper and mache and it turned out brittle, I’ll use your idea of letting kids chuck things at it to break it. Thanks for the post and the great ideas! You’re welcome, Leslie! If you didn’t see it already, be sure to check out the Mario Birthday Party Brainstorm article I’d linked to earlier. That one has dozens of fantastic ideas contributed by readers. I hope you and your Ethan have a blast tomorrow! If I wanted to make the pinata stronger for hitting couldn’t just do 1 layer of newspaper over it first and let that dry before using the tissue paper? I am sure it would work, though you might have to paint it white anyway. You have to let layers dry as you go anyway, so if it doesn’t seem strong enough, just add another.